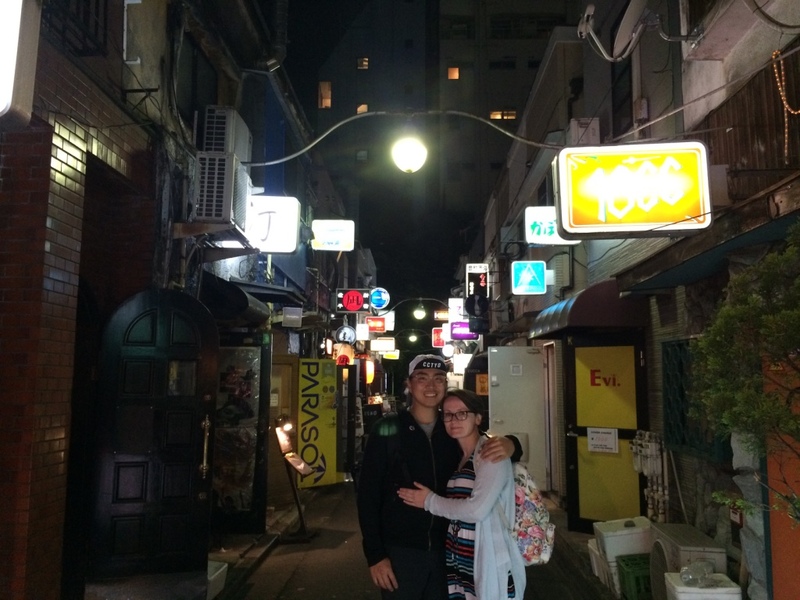 It makes me so beyond happy to be back in Japan. I think it's because there's so many things about Japan that fit perfectly with my personality. Japan is like my country soulmate. - They love themes. Everything is themed. I love themes. I could live my entire life in theme. 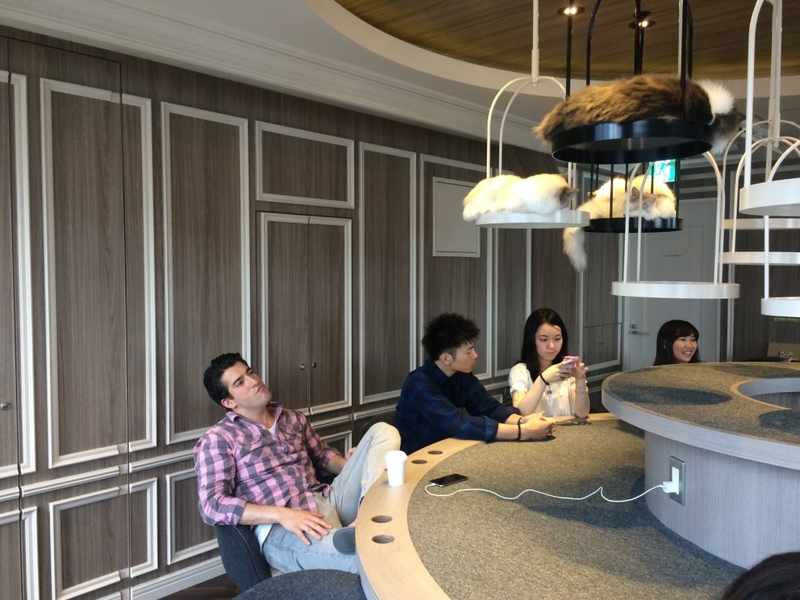 - Japanese efficiency is unparalleled. I love efficiency, possibly even more than I love themes. - Presentation is everything. Things are packaged and presented so prettily, everything is neat and orderly, and you just want to buy all the things all the time. - WHY IS EVERYTHING SO CUTE. Moving on! 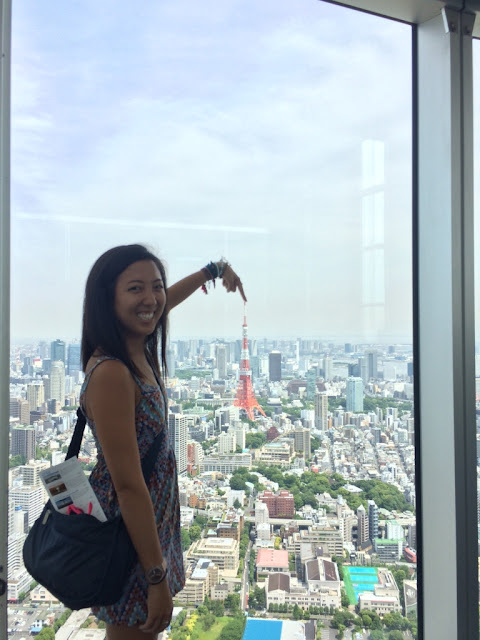 Here is a quick, brief synopsis of the Tokyo experiences I had, and the things you should do too if you go to visit! 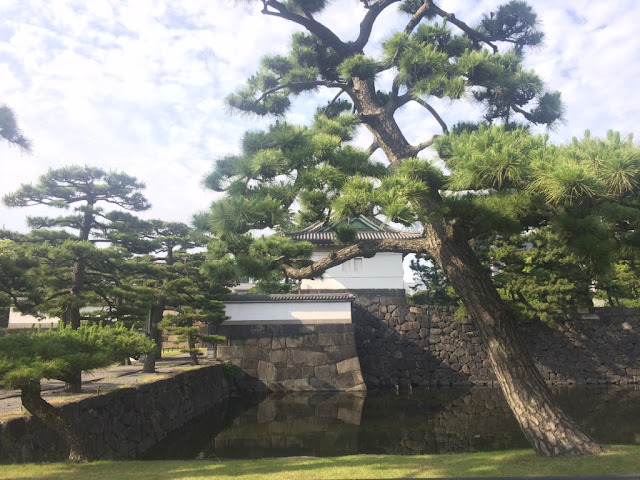 Confession - there is probably far less temple and museum-related stuff than there could be, so if that's your jam, there are plenty of those to check out too. But I can't help you with that stuff. Joining me in Tokyo adventures - in addition to my HSBF Kate and her BF Mark - was Karim (you know...ghosting Karim)! He joined for only a couple days over Memorial Day weekend, because he is apparently baller enough to fly halfway around the world for a long weekend. This was a fancy screen in Shinjuku that would put little hat icons on you if you stood there long enough. It's weird, the idea that you would travel somewhere just to watch people cross the street. 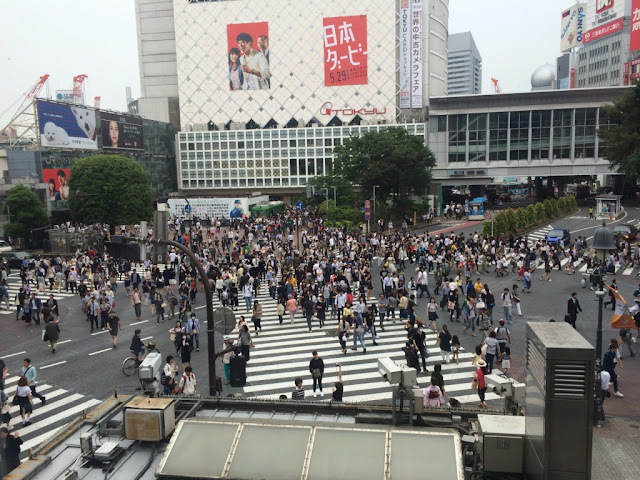 But that's what people do at Shibuya Crossing, one of the busiest pedestrian crossings in the world. 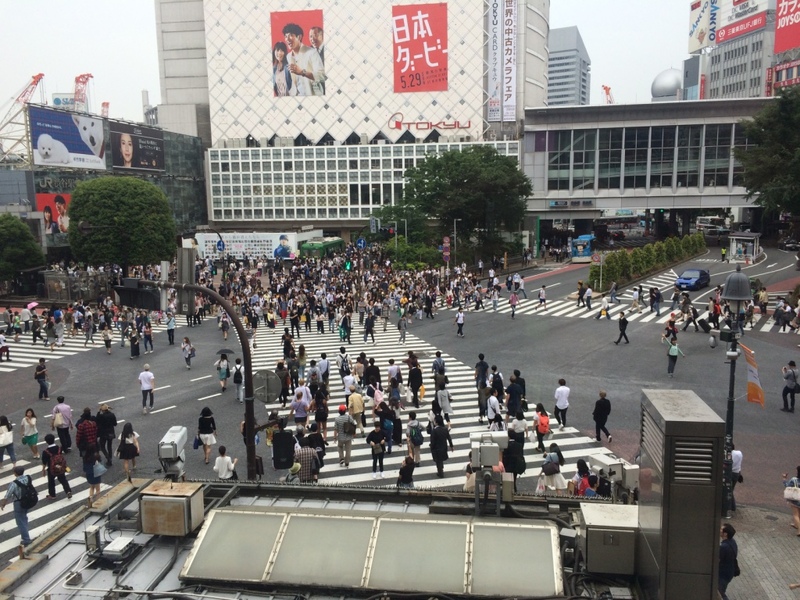 You can go to a Starbucks on the 2nd floor of the building across from Shibuya station and watch it all go down - when the light changes, hoards of people flood the street, and it's actually really cool to watch. 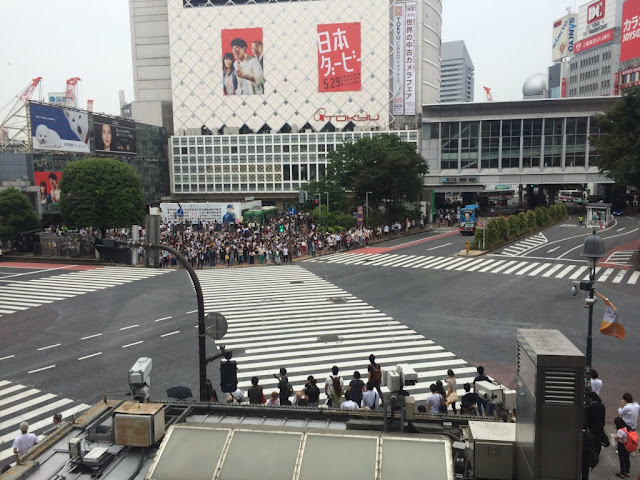 Because Japanese people never break rules, they all stand patiently to wait for the pedestrian light to turn green. I guess the video is better than a series of photos, but AGAIN, BLOGGER.....you fail me. 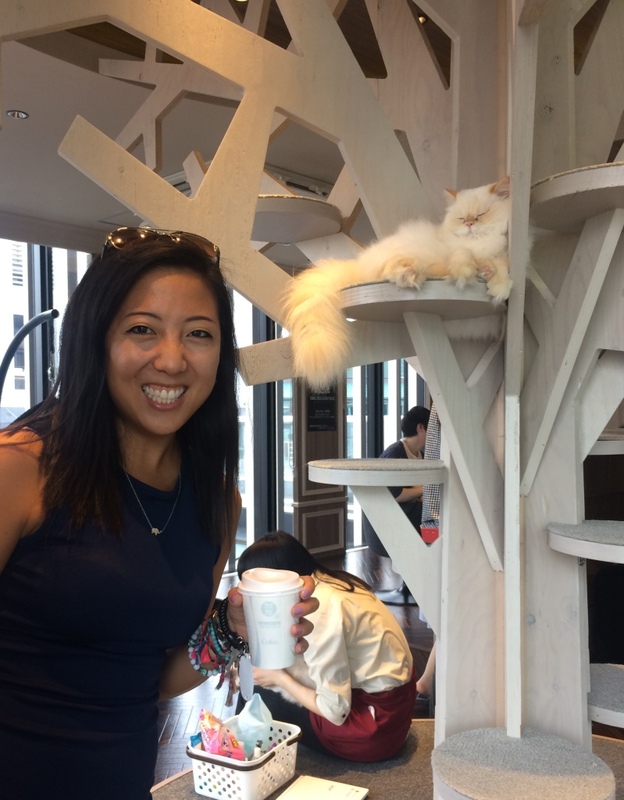 I dedicate this activity to my friend Jamie, who told me her one wish was for me to go to a cat cafe in Tokyo and take photos for her. It was actually pretty easy to find one - they're everywhere. 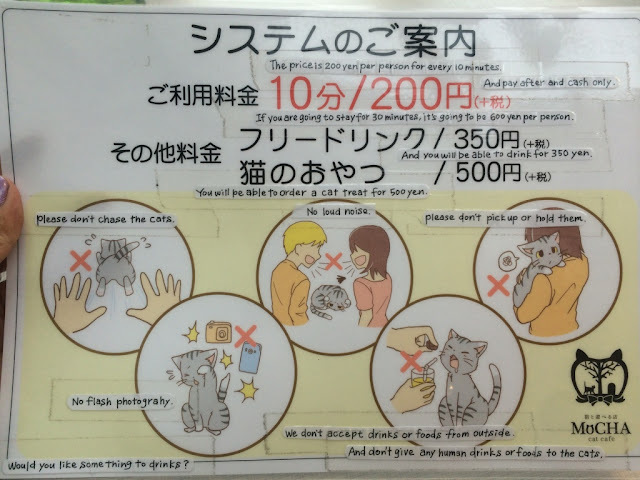 These were the cat cafe rules. 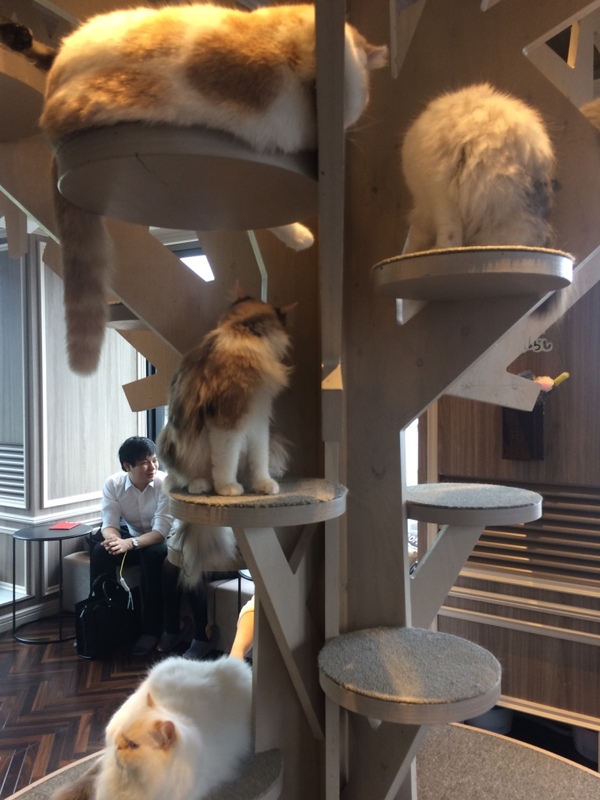 Yes, it is 200 yen/10 minutes to hang out with the cats (that's $2!!). HIGHWAY ROBBERY. And then - a tree full of cats! 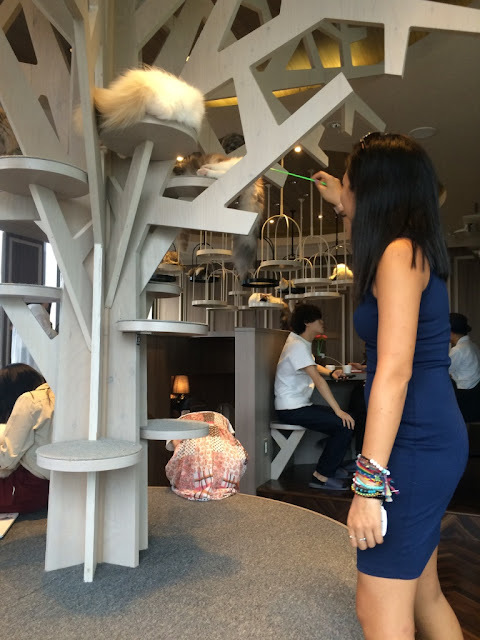 They gave you cat toy sticks so you could poke the cats. Or that's what I did, anyways. Mostly, the cats just wanted to sleep. But I am drinking a coffee, and there is a cat behind me - this photo is all for you, James. 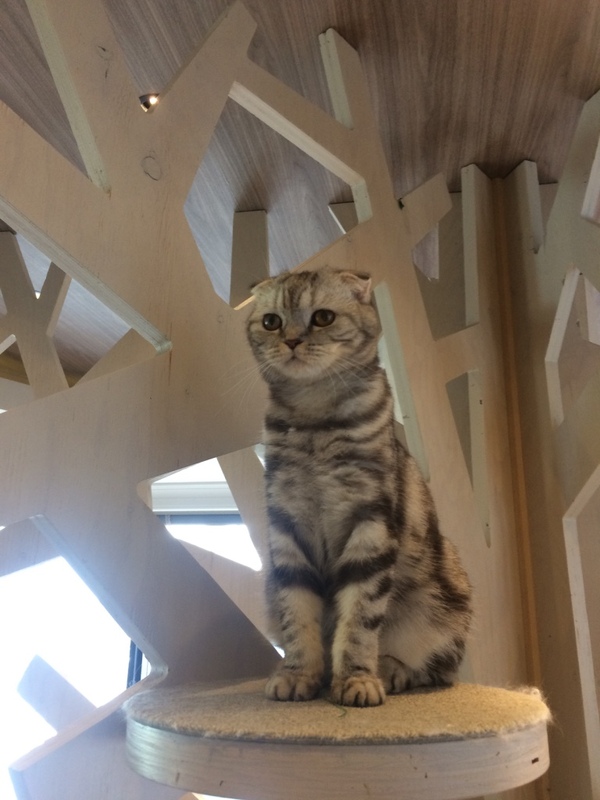 Karim was not as amused by the cat cafe. 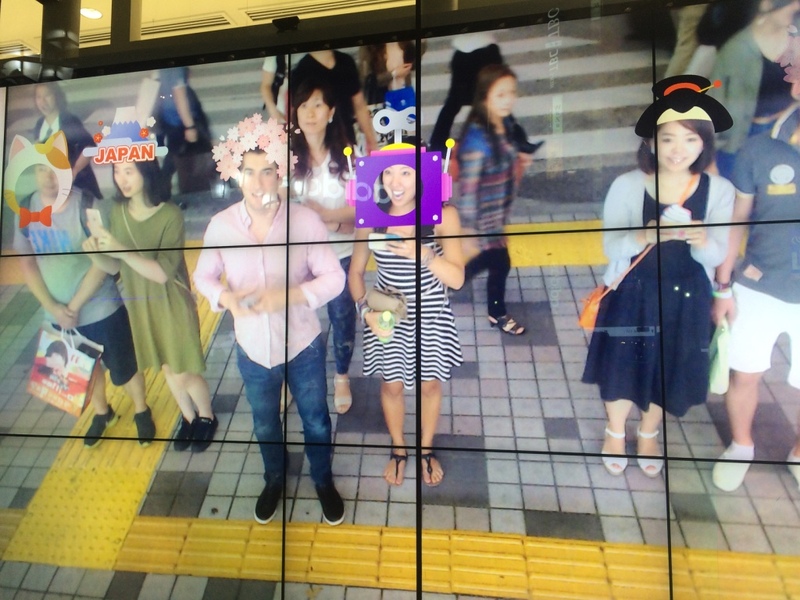 I think he was creeped out by all the Japanese girls fawning over the cats and shouting "kawaiiiiii!" every 2 seconds. 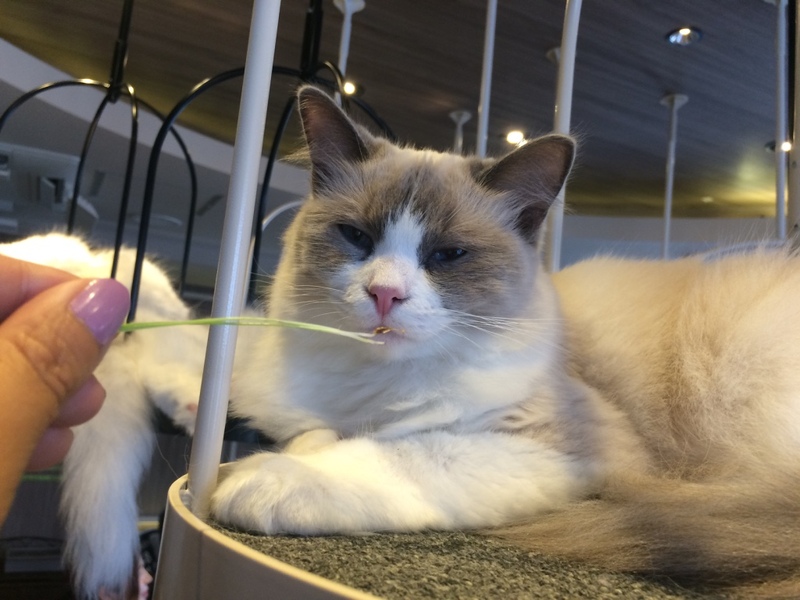 Karim quote: "It feels like none of the people in this room have ever seen a cat before"
The employees gave us plant stalks they claimed the cats would love eating, but the cats were definitely not interested. 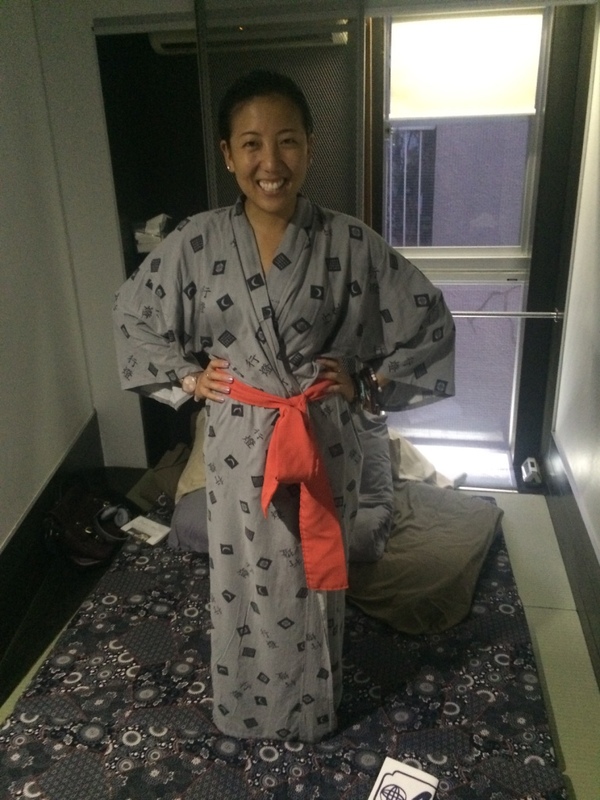 A ryokan is a traditional Japanese inn - complete with tatami mat floors, sliding doors, futons that go on the floor, etc. 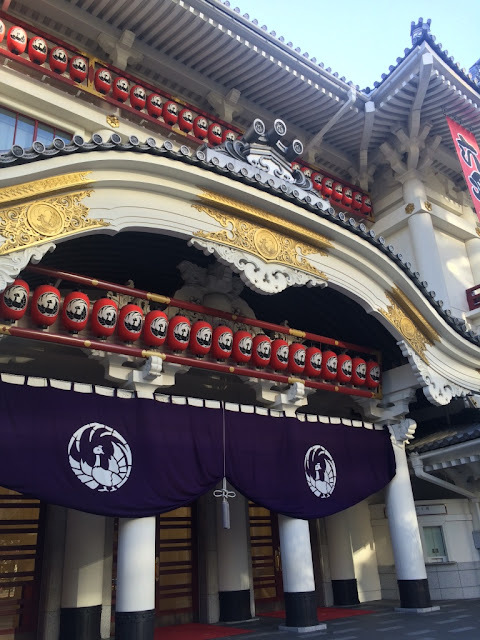 We stayed our first night in a ryokan on the outskirts of the neighborhood of Asakusa (though we opted to move to a fancier hotel in Shinjuku later, due to its more central location). 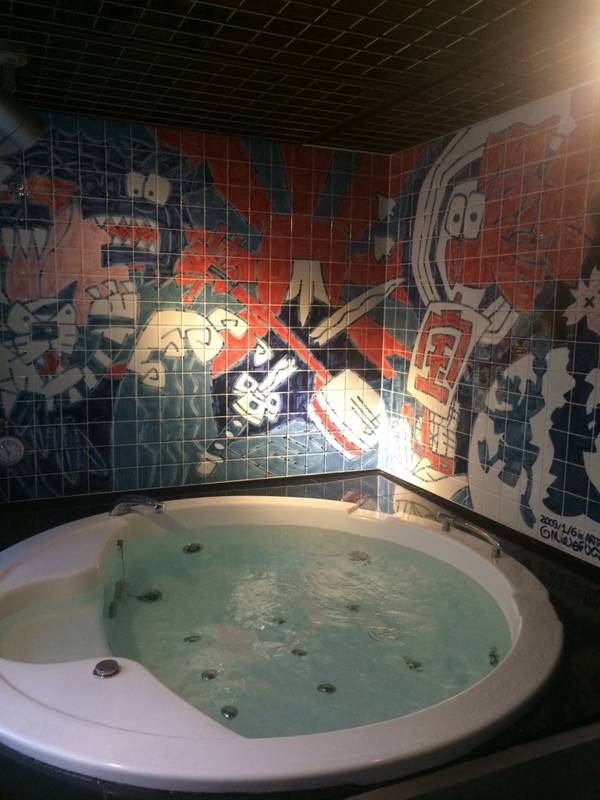 Our ryokan had a jacuzzi room you could sign up for! The Japanese people love their hot baths. Seriously. This restaurant located in Shinjuku, literally called the 'Robot Restaurant,' basically epitomizes all of Japan in one crazy, random, weird experience. 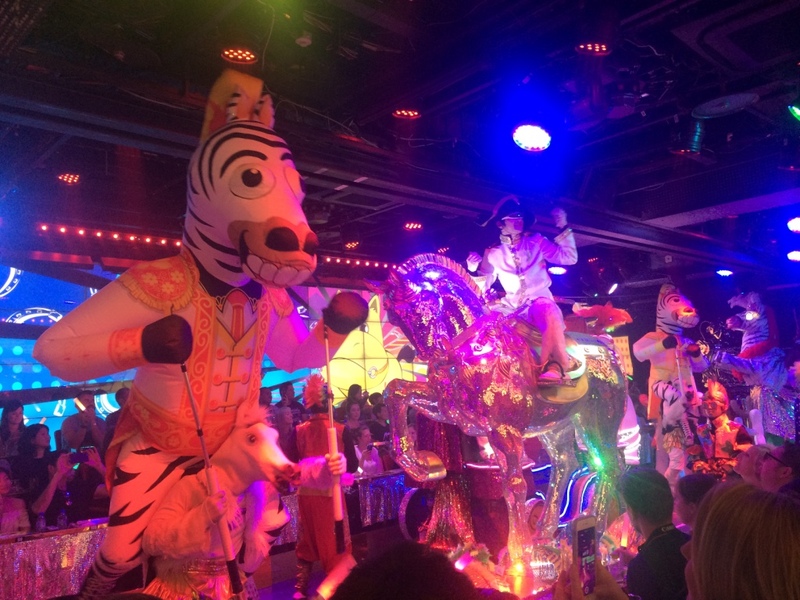 You can opt to have dinner or just get tickets to the show itself - there are 3 shows/night, tons and tons of robots come out and dance for you and act out stories and sing, and it was WEIRD. AND AWESOME. 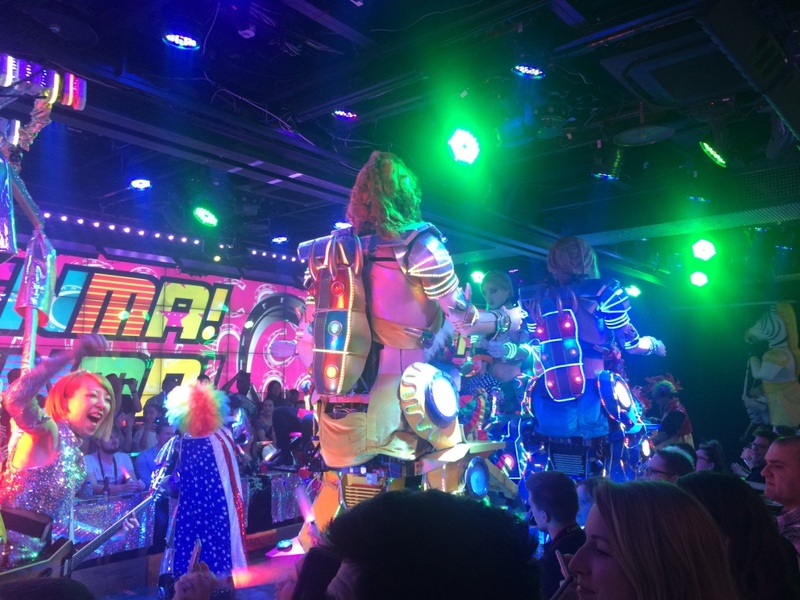 How do they have so many robots?!?! 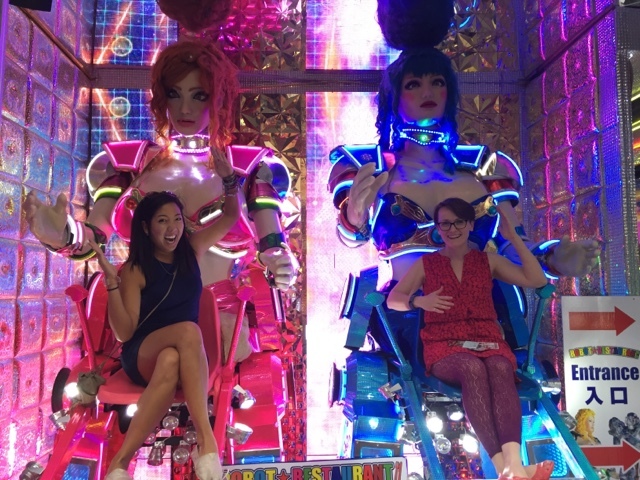 Kate and I outside the Robot Restaurant! 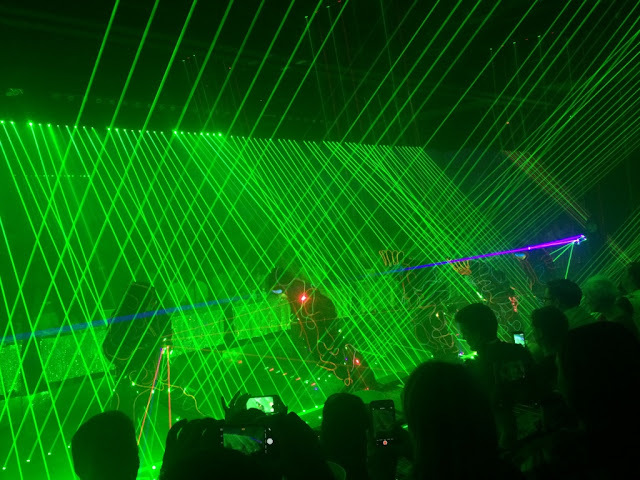 Like a rave. 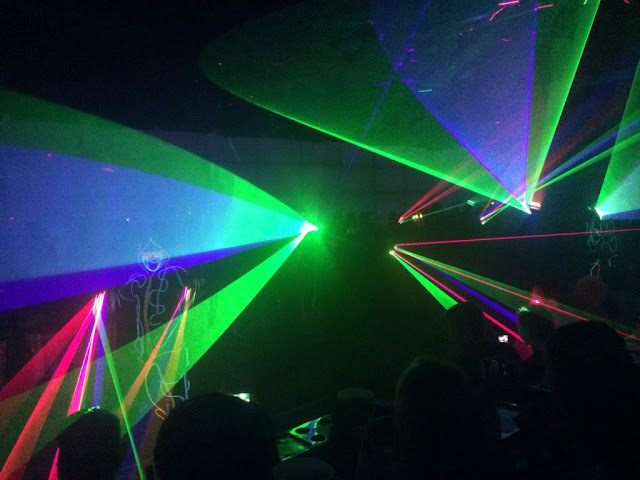 A robot rave. Seriously, half the time you have no idea what is happening. Yet you are still amazed. Look, I can do cultural things too! My dad has a best friend from his childhood in Taiwan, Mr. Lee, that lives just outside Tokyo and has for 30+ years - I've only met him a handful of times (one of those times being when I was like, 2 years old), but he and his wife were kind enough to come into Tokyo and take me out for the day after they'd attended church. 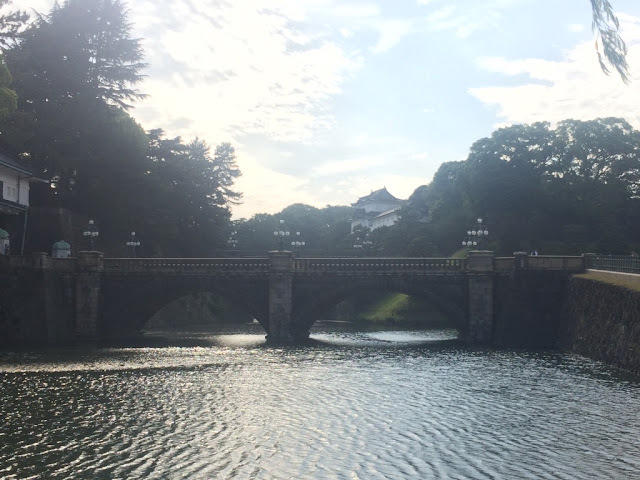 They were the greatest - they took me out to an amazing tempura lunch, then to the Imperial Palace to walk the grounds, then to a trendy shopping area to show me where all the latest young people were hanging out. I loved getting to spend the afternoon with them and feeling a little bit more like a local. Mr. Lee and I in front of one of the Imperial Palace buildings. There are lots of buildings. The imperial family still lives inside, people! 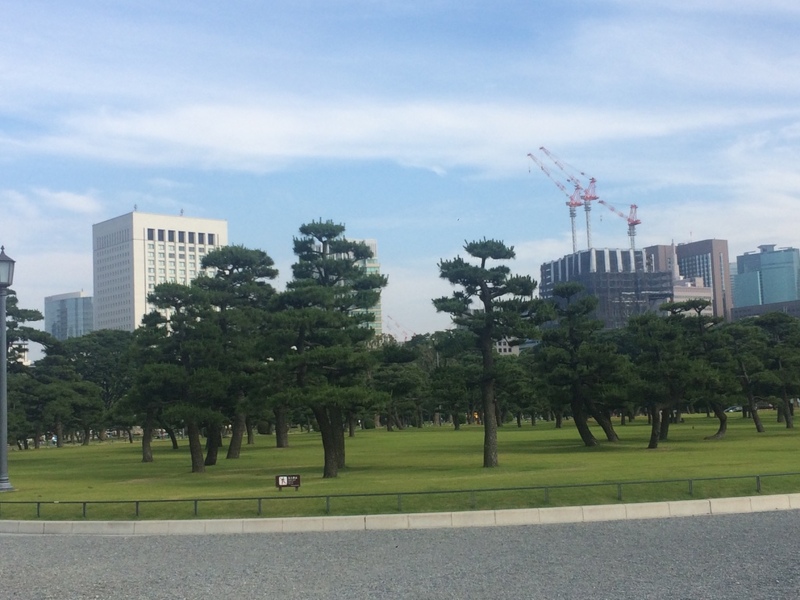 This is apparently some famous view of the palace grounds called the Nijubashi. Because there are two bridges. You can't see the second one in my photo because I am not a photographer. Japan is weird. You know that already. 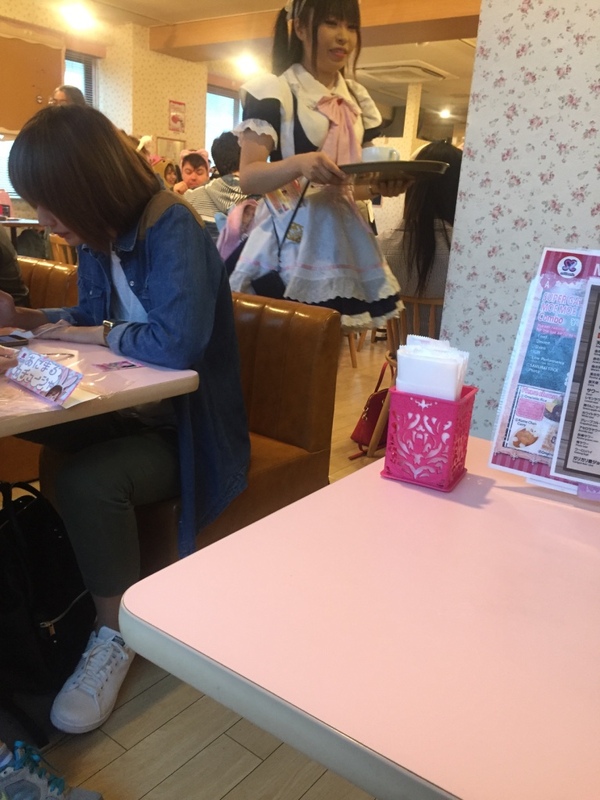 Maid cafes sprung out of inspiration from cosplay, which Japan is super into, and basically involves a cafe where girls dressed as maids serve you. But that's not the weirdest part. 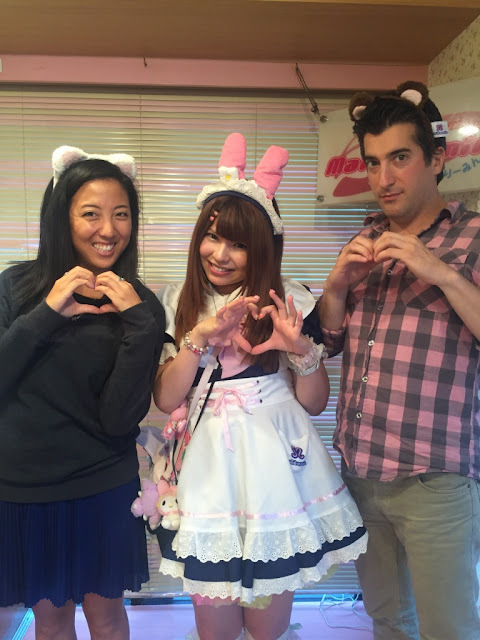 Karim and I were in Akihabara, a neighborhood known for its electronics stores (and maid cafes, apparently) and decided to stop by one of them to check it out (a maid cafe that is, not an electronics store). It was impossible choosing one, because there were ~50 on every block. The first one we walked into gave me the TOTAL heebie-jeebies - it was dark, it smelled weird, there were no windows, there was weird dark patterned wallpaper on the walls, and two creepy-looking old businessmen were being flirted with by a girl in a tiny maid uniform. I was so creeped out. I made us leave immediately. Undeterred, we found another one - one that was more well-lit and less creepy, and had other foreigners in it. 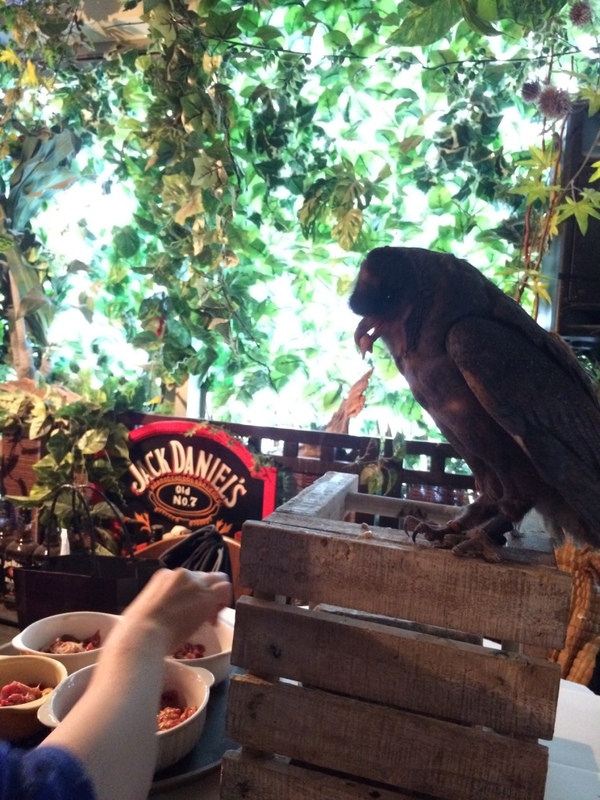 BUT IT WAS STILL ONE OF THE MORE UNSETTLING EXPERIENCES OF MY LIFE. We were ushered in by a girl wearing a maid costume, speaking in a super, super creepy baby voice. I fit right on in. I bet you didn't even notice me. 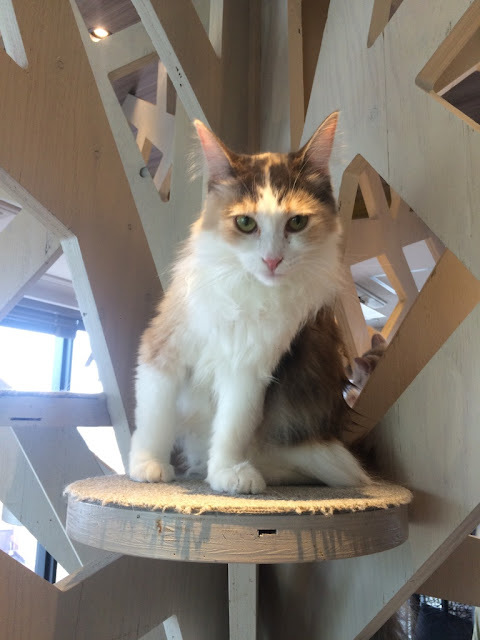 Not only did all the girls speak in these incredibly unsettling baby voices, but they made you do super weird things - like when you wanted service, you'd have to paw at the air and meow. 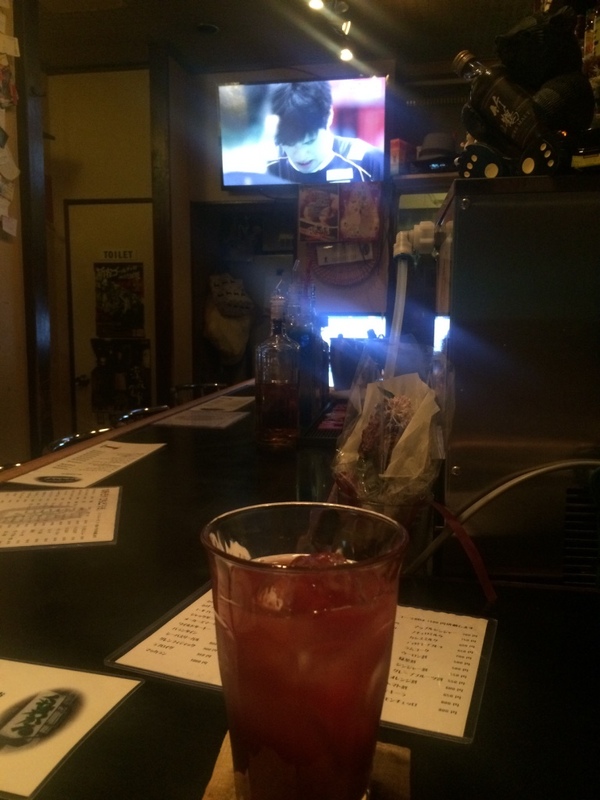 And when she served us our drinks, she made us make little heart symbols with our hands and say things like "cute! cute! LOOOOOOOOVE!" All in super-creepy voices. Eeeeeee I never want to come back, ever again. 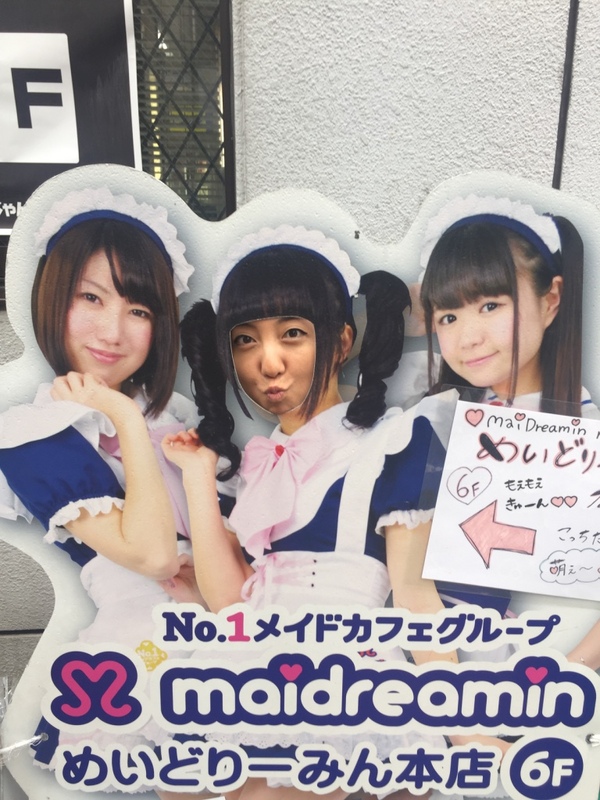 You weren't allowed to take photos inside the maid cafe. But Karim snuck one in anyways. And then they forgot to bring one of our items, so we negotiated a photo with a maid in its place (these cost 500 yen). They made us put on fuzzy animal ears beforehand. And make hearts with our hands (luckily, I have practice due to Tay). Karim was clearly very, very creeped out by everything. 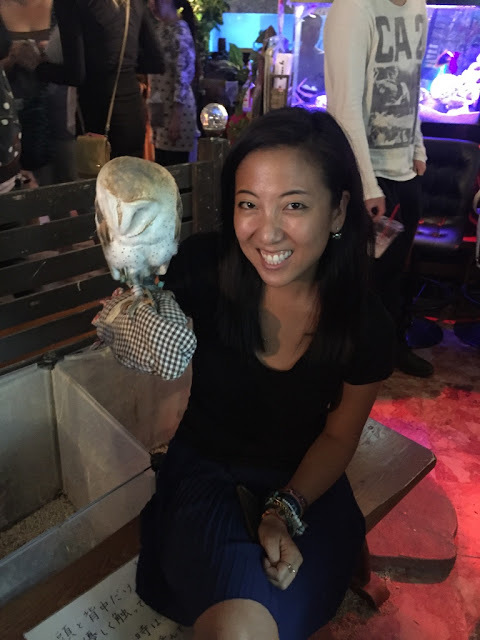 Fresh from being weirded out by the maid cafe, we went to the latest trend in Tokyo that Kate had told me about - owl cafes! 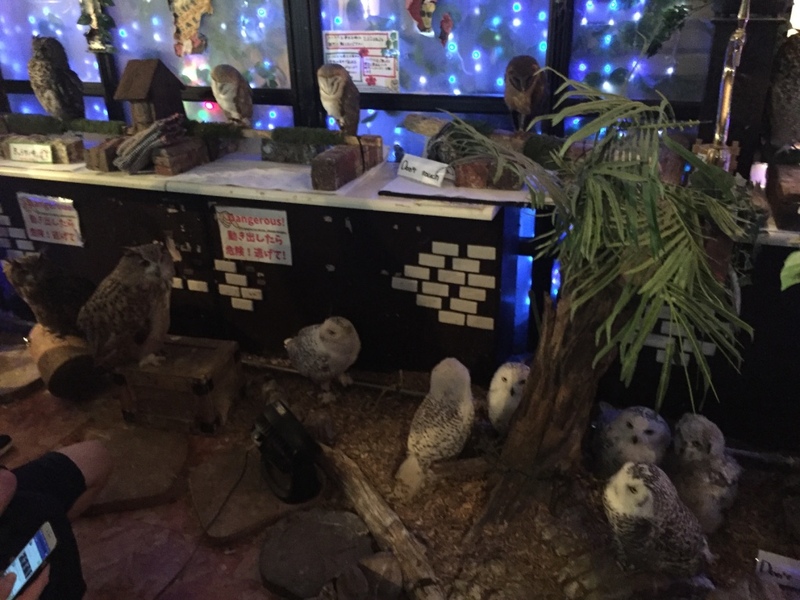 Like the cat cafe, but owls. 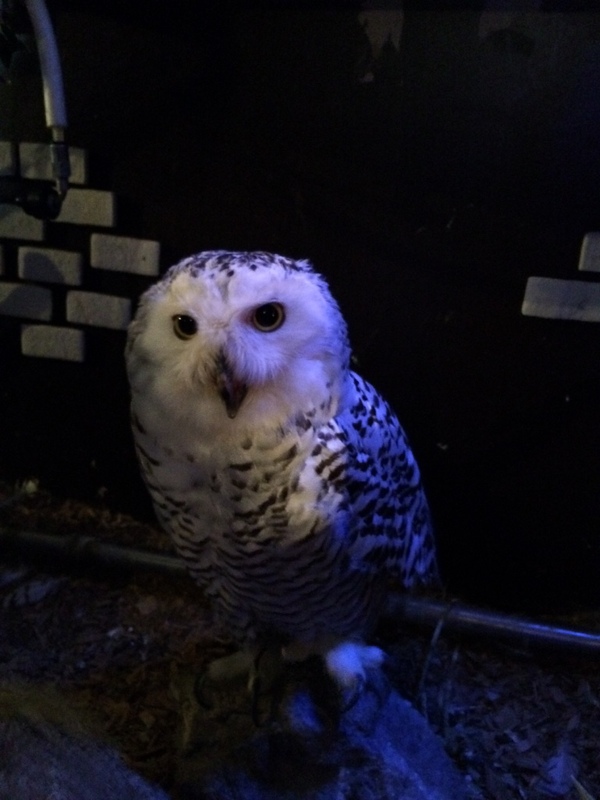 You usually need reservations for these because they can't have people overwhelming the owls. It was actually a little sad - do you see how many owls there are!? 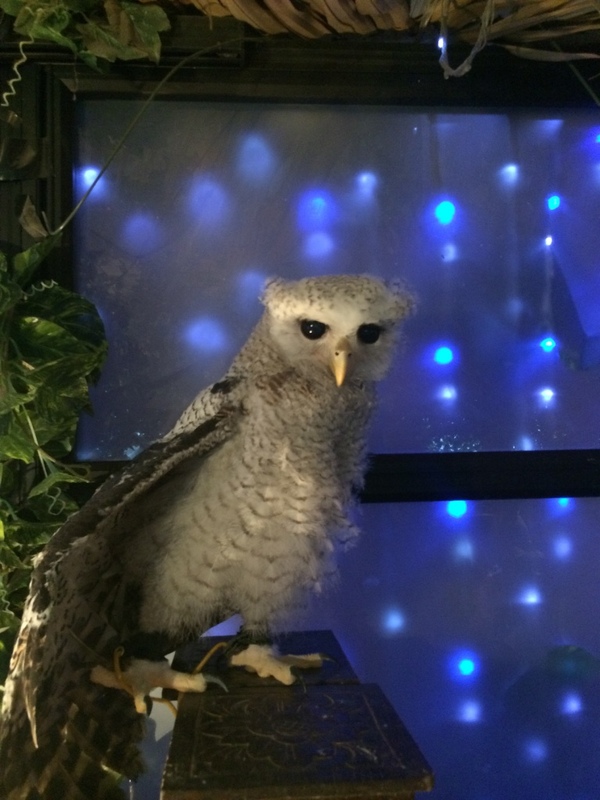 This one looks like a Harry Potter owl. There was no "cafe" part to the "owl cafe," except that you could buy drinks out a vending machine in the room. 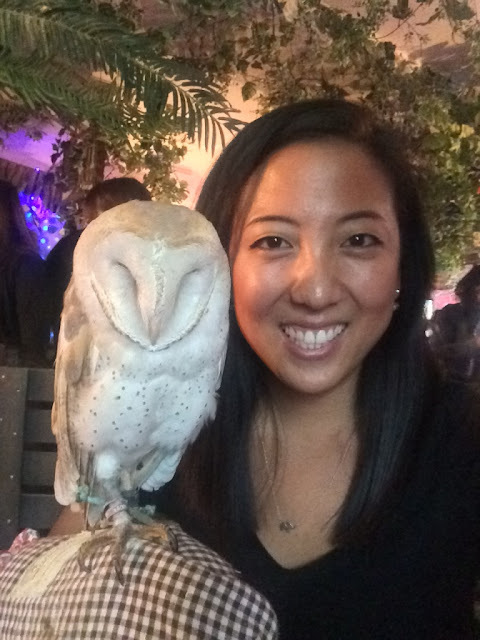 I will say, it was cool seeing the owls - but I don't know how happy these owls are. Which made me a little sad. 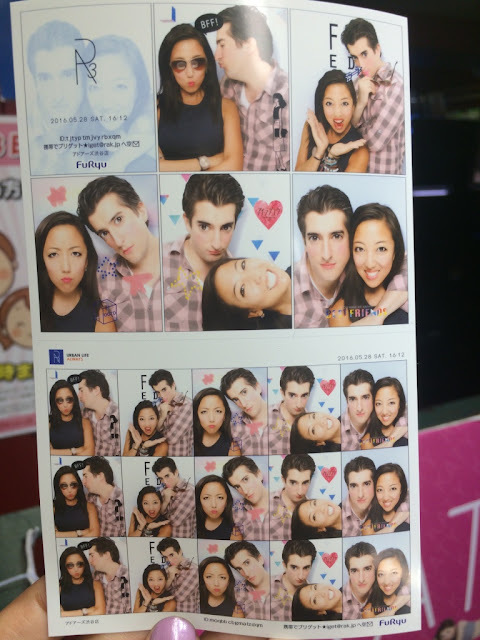 PURIKURA IS THE BEST. 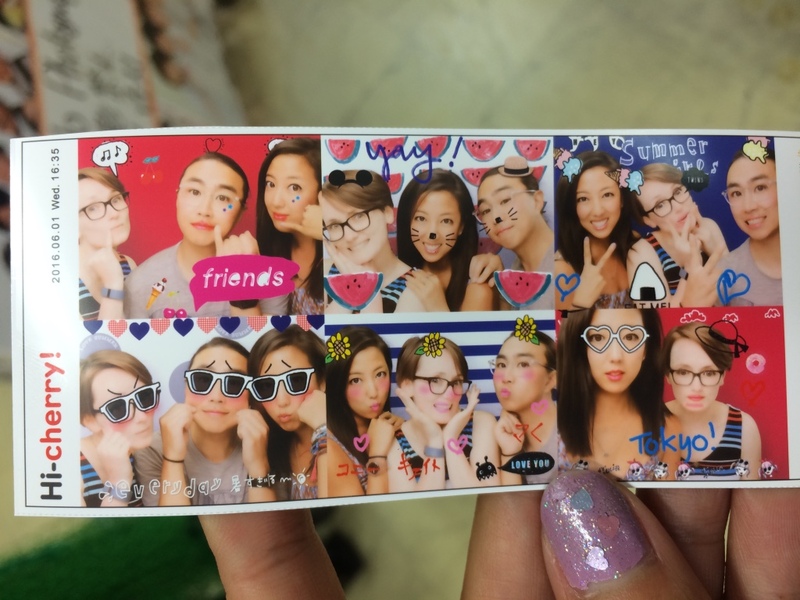 These are the photo booth machines, which are ON CRACK in Japan - they basically make you as white as possible, auto-enlarge your eyes, thin your cheeks, give you lip color, and make you "beautiful" by Japanese standards. And then you can add additional icons and words and photos and features as you please. 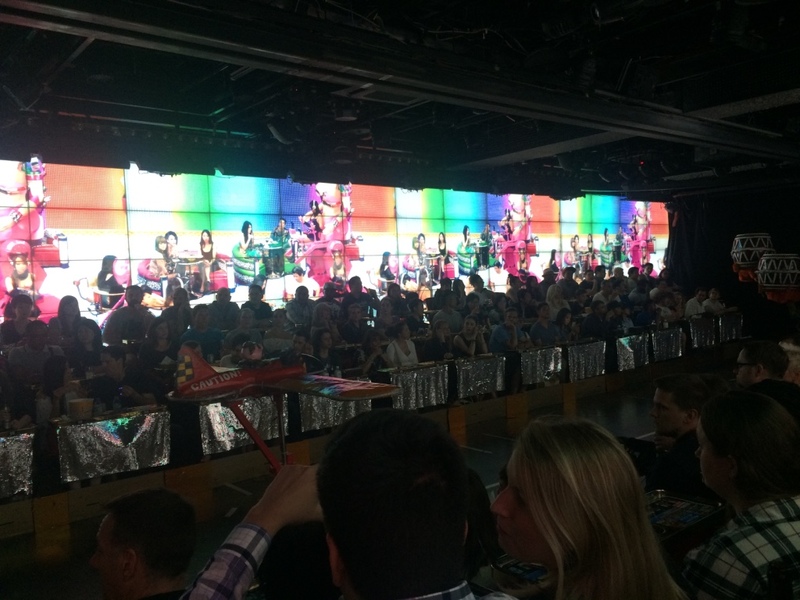 The machines are totally out of control - there's multiple screens, options, etc. that are totally overwhelming if you don't understand what you're doing. Japanese girls love these things. 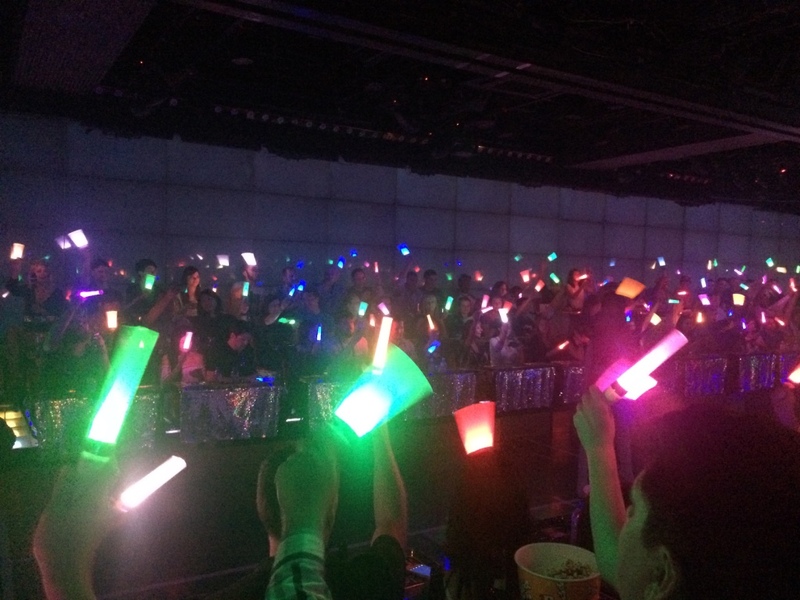 They go all out. Our first try at purikura - which really freaked me out, because Karim with giant eyes and blush and lipstick is not so settling. Second try - we did much better, but you can clearly tell which photo was taken when Kate and I were trying to figure out the machine and were completely unprepared for. 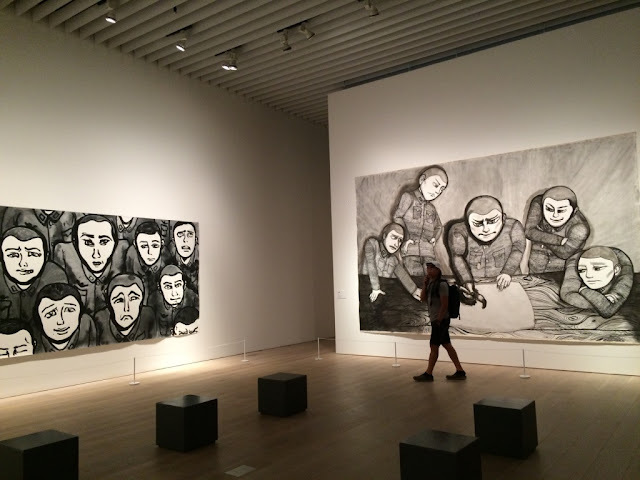 The Mori Art Museum is in a super-fancy building right across from the Roppongi Hills tower in Roppongi - it's a modern art museum, which is cool in itself, but an amazing additional bonus is that the admission includes a sky view of Tokyo from the top floor. View over Toyko! The greatest thing is that the Tokyo view literally spans all 360 degrees - as far as the eye can see. There was also a Sailor Moon exhibit that all the Japanese girls were going NUTS over. 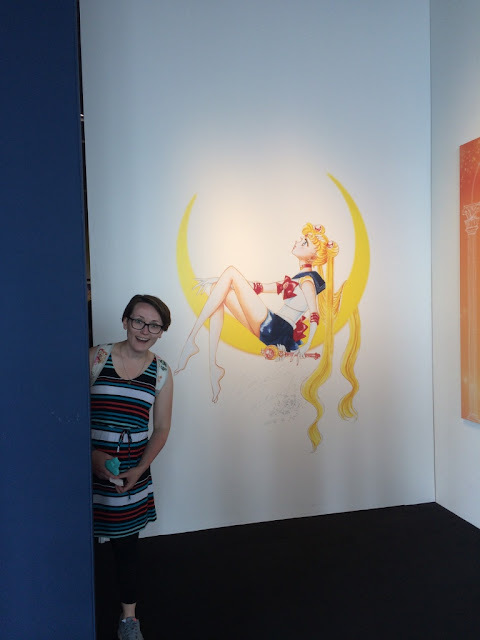 Kate, Mark and I had zero idea what was going on, given that we had zero Sailor Moon knowledge between the three of us. But Kate is still excited to be here! 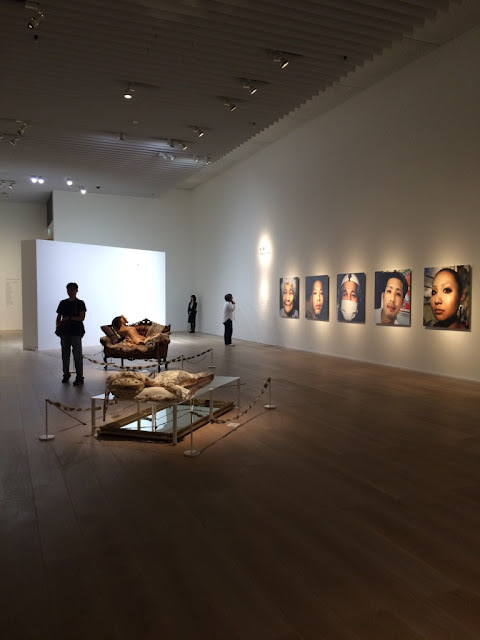 The Mori Art Museum was doing an exhibition called "My Body; Your Voice." It was actually super, super cool. I think I like modern art. 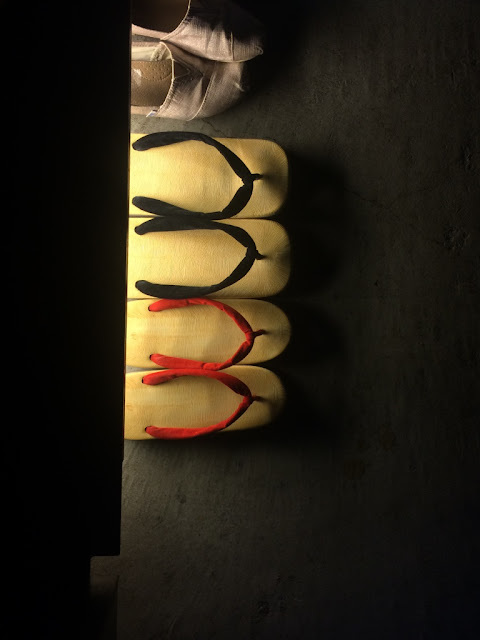 The Golden Gai is a couple rows of small, compact alleys in Shinjuku - here, old-world Japan has stayed intact, and tons of small bars that have maintained their tiny, traditional atmosphere are packed in here. It's a cool area, and there are so many tiny tiny bars (most can only squeeze in 5-10 people) - but a lot of them have table charges (like, they charge you just to SIT AT THE TABLE), which I don't love. 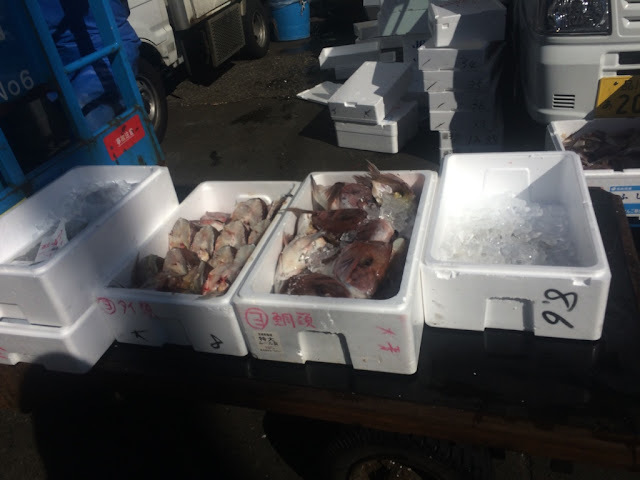 The Tsukiji Fish Market is SO COOL. YOU HAVE TO GO. 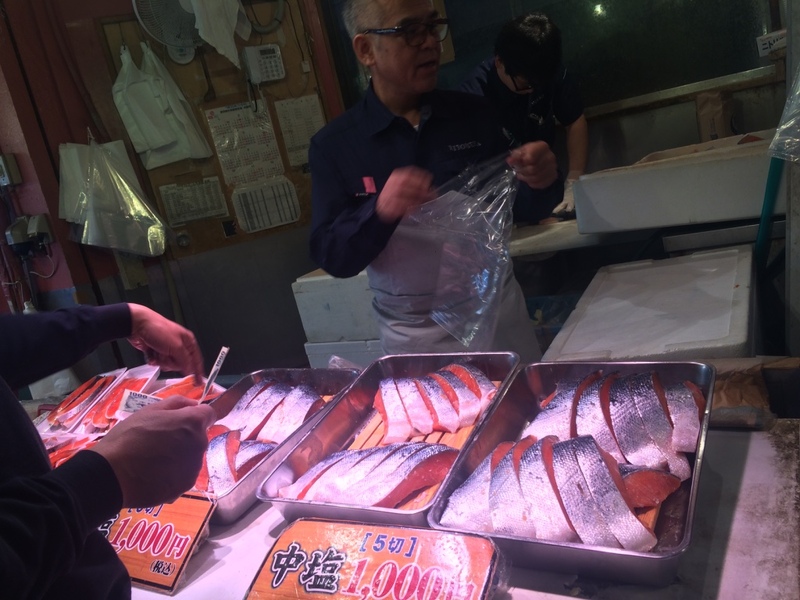 The same fish market that's in "Jiro Dreams of Sushi," yes. The Tsukiji Fish Market is a huge, famous wholesale fish market that operates every morning (except Wednesdays and Sundays) in Central Tokyo. One famous part is the Tuna auction - it starts at 5am, and they only let a certain number of tourists in a day, which means you basically have to leave your hotel around 2:30AM in order to ensure a spot at the market. I gave this option a hard pass. Otherwise, you can arrive anywhere at the market up until about 11am or 12pm. It's super fun to walk around to check out all the stalls and what they're selling, and there's a ton of sushi restaurants offering the freshest sushi you can find around. Unfortunately, you still have to get to the market quite early in order to eat at some of the best sushi restaurants. 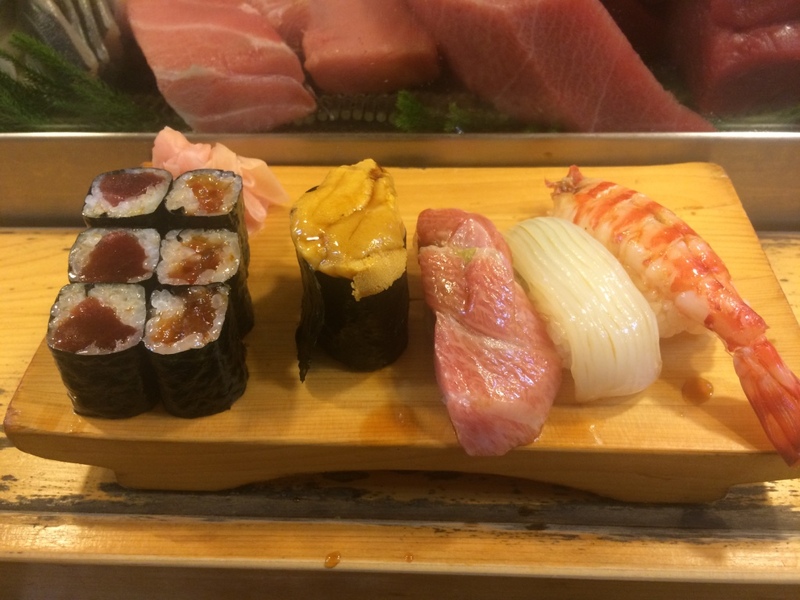 There are two in particular that are very well-known - Sushi Dai, and Sushi Daiwa. I opted to get up and head to the market around 5:30AM, in order to avoid the worst, most ridiculous waits ever. 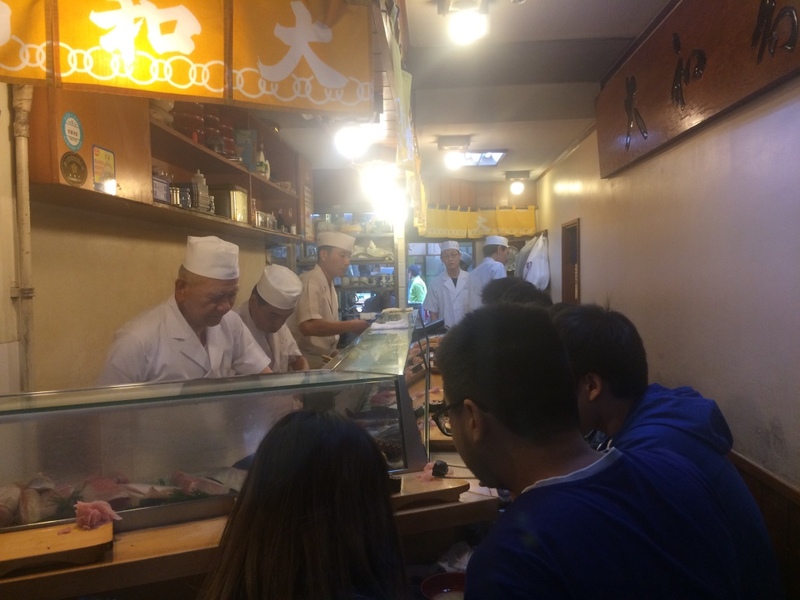 I got to the market around 6:30AM - and Sushi Dai had already shut down the line for the day (there were tons of people in line), but Sushi Daiwa only had about an hour+ line. So that's the one I stood in. As I was by myself, you can sometimes squeeze in earlier because single seats will come up at the counter (Karim had gone to the fish market a couple days earlier and had managed to get in much faster being by himself) - but unfortunately for me, there were a couple singles in front of me in line already, so while they got pulled out earlier than the total wait, I basically had to wait the entire time. It wasn't so bad. A snapshot of the lines outside the sushi joints. 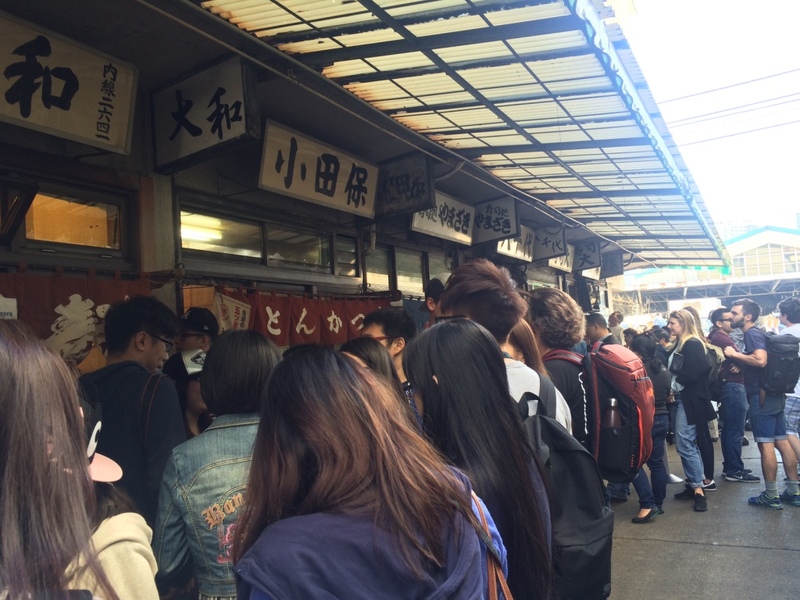 Can you believe this many people want to eat sushi at 6AM!?!? Finally, I got in! And got the omakase, which is the chef's choice - he provided an assortment of sushi that kept coming. 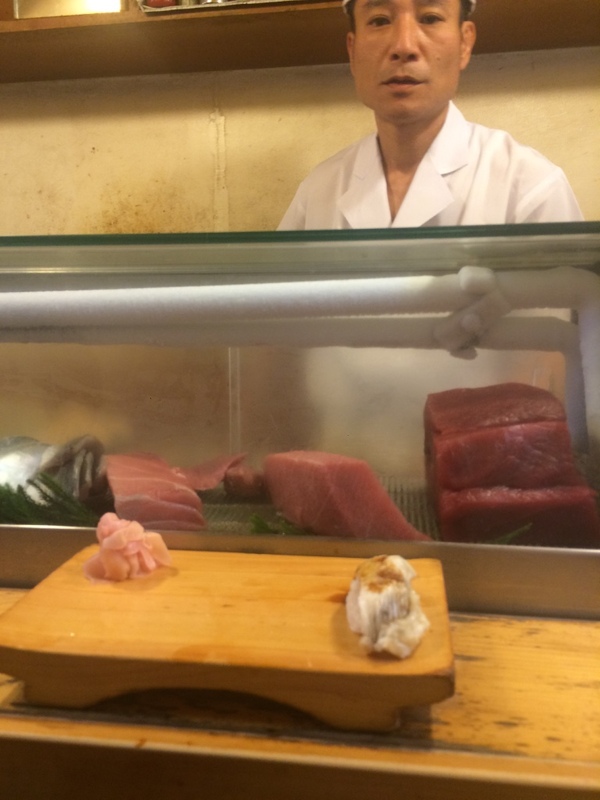 Here was my sushi chef, looking all taken off guard, after I'd nommed down all the sushi he'd given me. Eating 20 pieces of sushi at 7am is weird. But it was seriously some of the MOST DELICIOUS, melt-in-your-mouth sushi I've ever had in my entire life. I almost died of happiness. 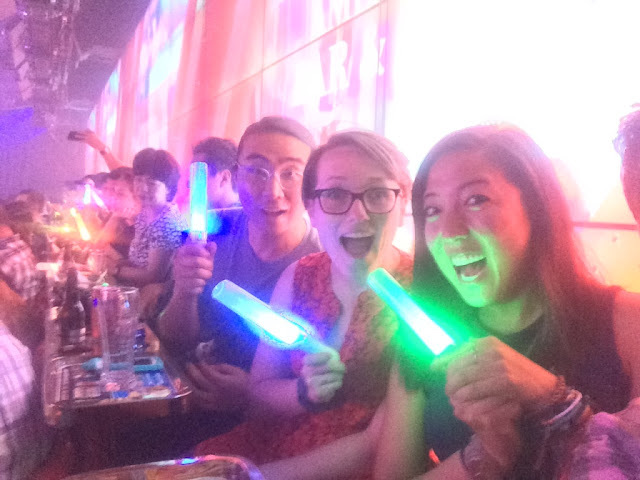 To add to the amazing experience, I was seated next to another single; an older Japanese man who seemed to be a regular. He walked in, everyone knew him, and they brought out a beer and individual kinds of sushi for him without him even asking. 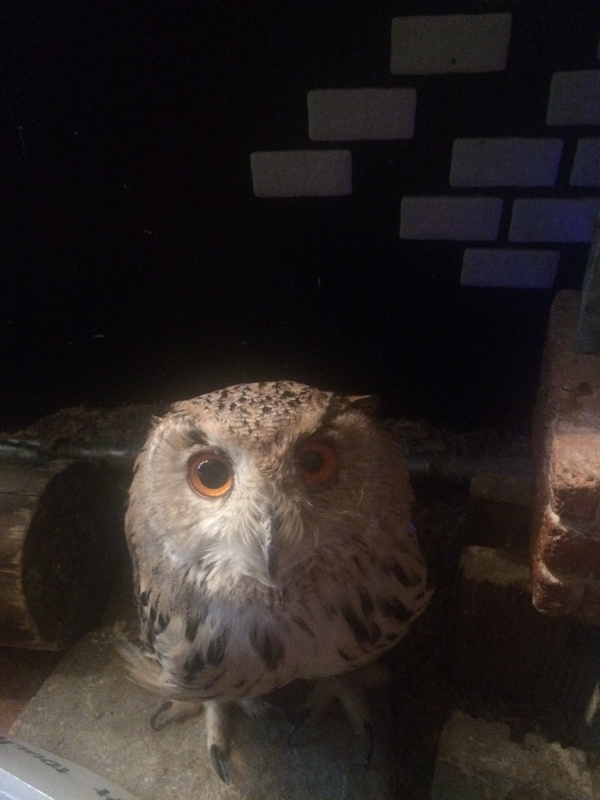 He started a conversation with me, and we communicated using my (incredibly broken, almost non-existent) Japanese skills and his (also limited) English skills. He was asking where I was from, and I asked him about his life too - he's apparently retired so he said that every day is a vacation for him, and every time he comes to Tokyo, he comes to Sushi Daiwa. He then asked the chef to add some extra special pieces of sushi he was eating to my order as well. As I was finishing up and preparing the leave, the man asked me if I was leaving. I said yes, and he gestured to the chef and told him he was paying for me as well. I protested (in my terrible Japanese), but the man insisted and waved me away. He smiled at me, told me to enjoy my trip, and gave me his business card and told me to let him know if I'm ever in Canada (where he has a summer home). 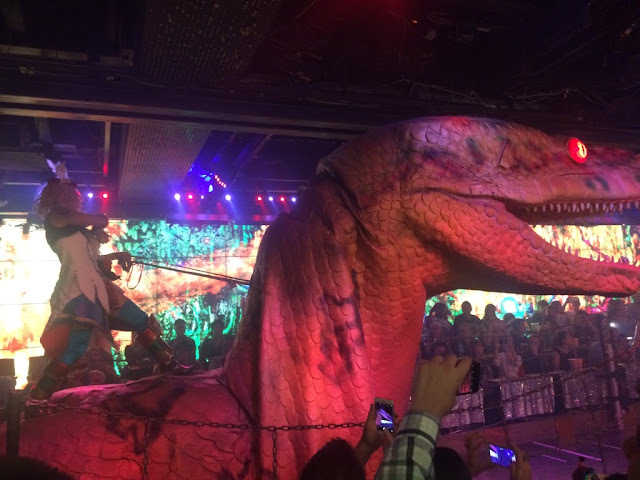 And then he put some bills on the counter to cover the bill and disappeared out the back door into the crowds outside. It was the NICEST. THING. EVER. I seriously almost cried; it touched me so much. Such an incredibly sweet gesture (especially because I'm fairly certain the bill was not cheap), and completely unexpected. 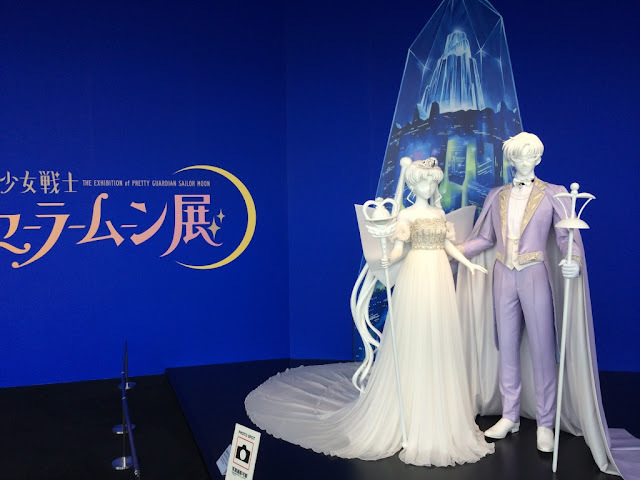 I love you, Japan. After the man paid for me, my sushi chef kept looking at me and saying "You. Lucky. 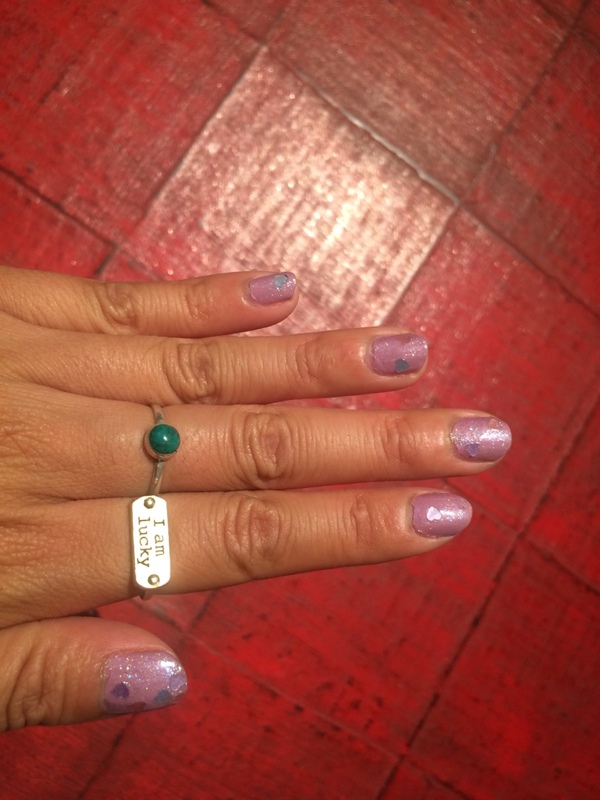 Very lucky." I KNOW I AM, SIR. I EVEN WEAR A RING TO REMIND MYSELF OF THIS FACT. 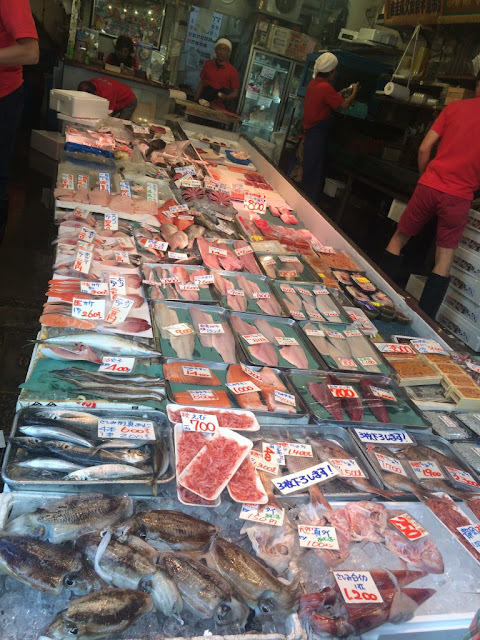 So much fresh fish everywhere! 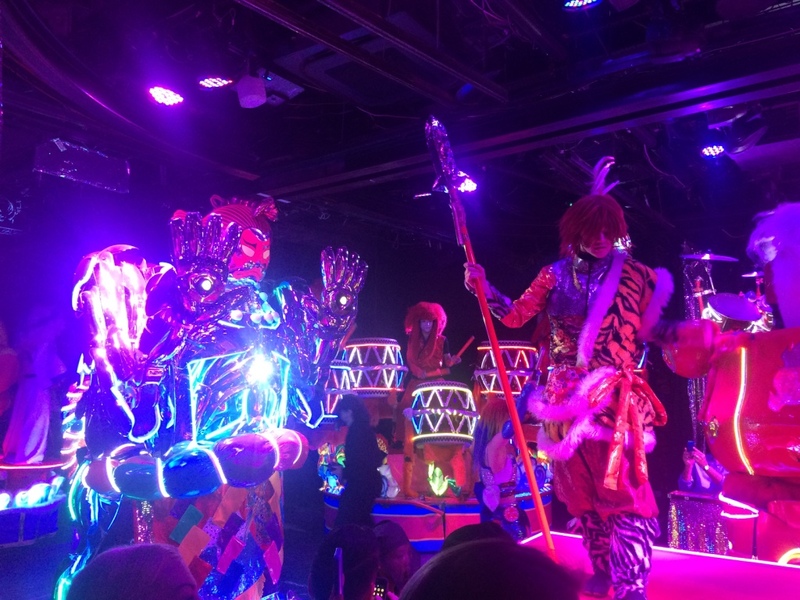 Festivals in Japan are seriously the best. 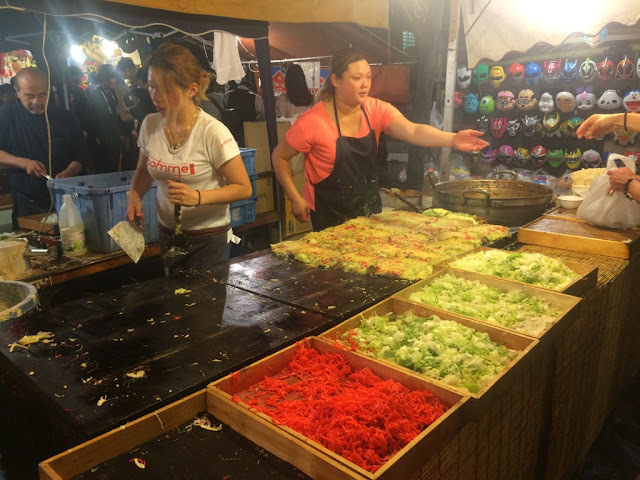 Not just because they're super cool and usually involve some kind of very random parade, or act, or tradition - but because the food stalls are also the best! BEST. 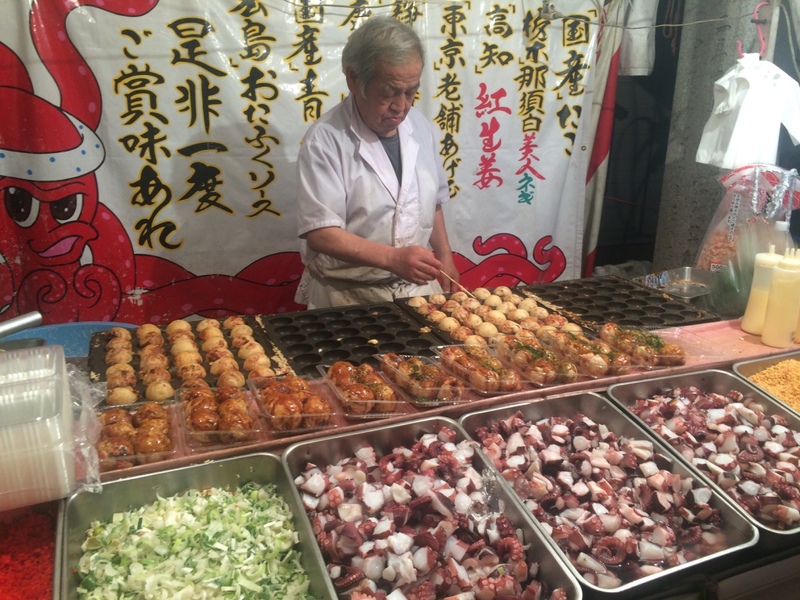 Nobody does street food and treats like Japan does. Karim and I happened to stumble upon some festival while we were wandering around Shinjuku one night, and it was amazing. 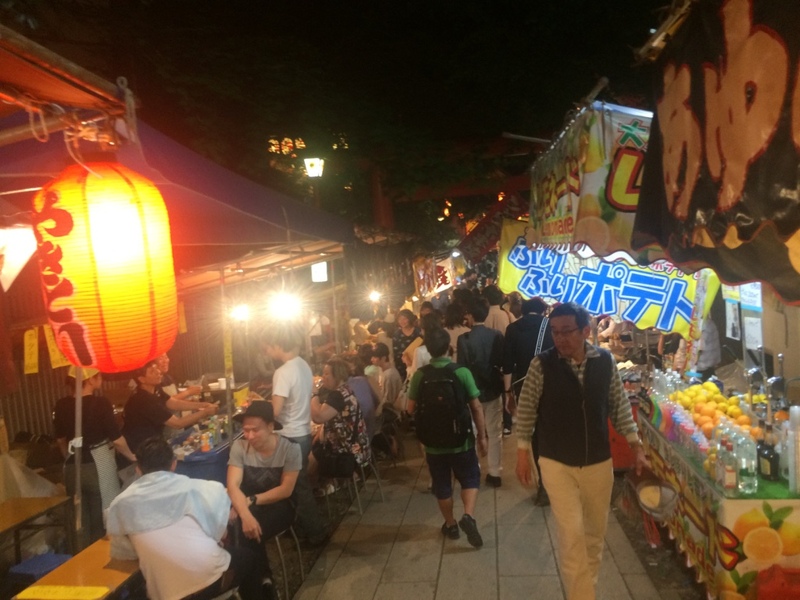 So many amazing street food stalls! 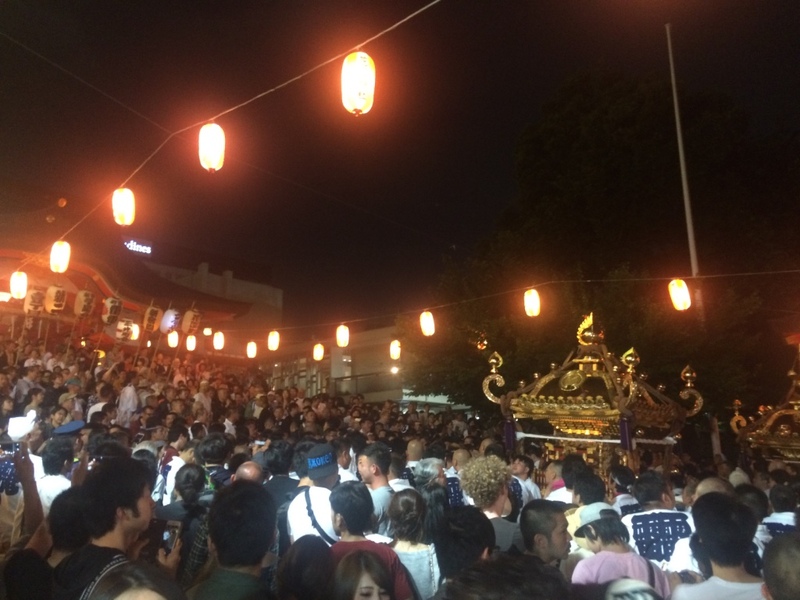 This place was super crowded - we never quite figured out what the festival was for, but it did involve people dressed up and carrying this golden shrine thing through town.